Kentucky Advance Deposit Wagering Provider Surety Bond • Surety One, Inc.
During a special meeting the Kentucky Horse Racing Commission promulgated new rules for 2017 licenses which include the additional requirement of a Kentucky Advance Deposit Wagering Provider Surety Bond. “Advance deposit account wagering” means a form of pari-mutuel betting in which an individual may establish an account with a person or entity licensed by the Commission, and may place a pari-mutuel wager through that account operated by a licensee. The purpose of the surety bond as per the Commission is to protect any person or entity injured or suffering financial loss by reason of the licensee’s failure to pay taxes, fees, and funds due and owing to its account holders, the Commonwealth of Kentucky or Kentucky licensed racetracks, or by reason of the licensee’s failure to otherwise faithfully comply with all laws, rules and contracts related to the license license to conduct advance deposit wagering. 1.) 125% of daily account value + 400% of the excise tax amount. 2.) If the wagering provider was not licensed for operation in the Commonwealth of Kentucky prior to November 1, 2016, the surety bond must be $100,000. 3.) If the sum of the regulatory formula (125% + 400%) is less than or equal to $100,000, the surety bond must be $100,000. 4.) If the sum of the regulatory formula (125% + 400%) is less than or equal to $100,000, the surety bond must be $100,000. The Kentucky advance deposit wagering provider surety bond is non-cumulative, the liability of the surety for the aggregate of any and all claims which may arise thereunder being limited to the bond amount on its face, regardless of the number of years the suretybond is in force or the number of claims made against this bond. 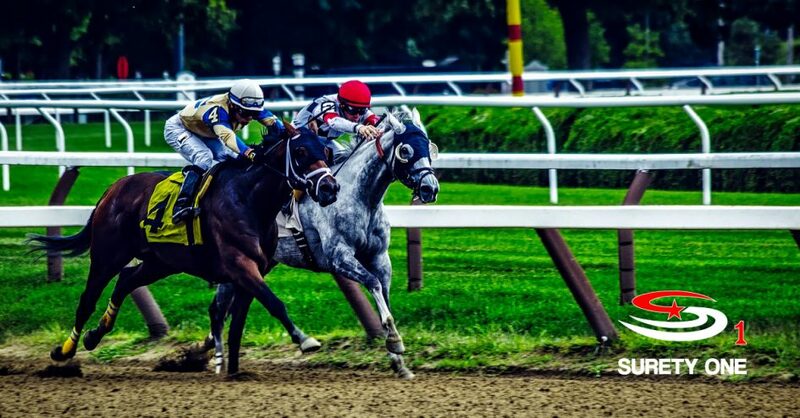 The surety may cancel the surety bond by sending written notice to both the wagering provider and the Kentucky Horse Racing Commission by certified mail. Cancellation is considered effective sixty days after notice of cancellation is received by the licensee and the Commission. Questions about the new bond requirement or licensing should be directed to the Commission at 4063 Iron Works Parkway, Building B, Lexington, Kentucky 40511 Attn: Steve May, Director of Pari-Mutuel Wagering and Compliance. National surety bond leader, Surety One, Inc. offers immediate approval of your wagering provider bond request. Our special programs afford each applicant bonding capacity regardless of credit and/or financial condition. Operating in multiple states? No problem! We offer surety bonds in all states and offer fidelity bond coverages for this class of business. Visit us at www.SuretyOne.com, call (800) 373-2804, or email us at Underwriting@SuretyOne.com for a Kentucky advance deposit wagering provider surety bond application or for information on any surety need.